Israel has freed 26 Palestinian prisoners convicted in deadly attacks against Israelis after a court rejected an appeal by the victims’ families to halt the move. The prisoner release is the third of four planned as part of US-brokered peace efforts. Most of the 26 inmates set free Tuesday were convicted of killing Israelis and spent between 19 and 28 years in prison. Almost all were jailed before the Oslo Accords, when the first Israeli-Palestinian interim peace deals were signed in 1993. Three of the prisoners were released to the Gaza Strip, 18 to West Bank and 5 to East Jerusalem. A number of streets were closed off due to the rally, organized by the chairman of the Almagor terror victims association, Meir Indor. Despite mass protests, the release of the prisoners was carried out overnight. Their relatives and supporters gave a heroes’ welcome to the men, celebrating with fireworks. 51-year-old Ahmed Shihadeh, from the Qalandia refugee camp in the West Bank, spent nearly three decades in prison after being convicted of the murder of an alleged collaborator with Israel. For the past two years his mother was unable to visit her son in prison because she could no longer walk. “I’ve visited him in 14 jails. I would leave my kids screaming and go for a visit,” Haseba Shihadeh told AP. In total, Israel said 104 prisoners would be set free; 52 have been released prior to those 26 released on Tuesday. The fourth round of releases is due to take place in April. Meanwhile, Israeli Prime Minister Benjamin Netanyahu has come under fire for his decision to balance out the series of controversial releases with plans to build 1,400 new homes in both the West Bank and East Jerusalem. Palestinians see the settlements (which most countries regard as illegal), as an obstacle to a viable state they seek in the West Bank and the Gaza Strip. Israel took possession of those territories in the 1967 war and pulled out of the Gaza Strip. The Palestinians have appealed to the US to block the expected announcement, saying such construction threatens peace efforts. Both the US and the EU have spoken against settlement plans. Netanyahu pledged he would not back down, however. “In these negotiations we are faced with our essential interests, including guaranteeing the settlements in the land of Israel,” he said. In another move that could also hamper peace efforts, an Israeli Cabinet ministers committee on Sunday backed a bill that would annex a section of the West Bank near the Jordanian border to Israel. Netanyahu insists that Israel must maintain a presence in the area for security reasons. Abbas rejected the move. “This is Palestinian land and we will not let them do it,” he said in Ramallah. The chances are small that the bill will receive parliamentary approval, however. Israel’s chief negotiator, centrist Justice Minister Tzipi Livni, said she would use all her political influence to block the legislation from being voted on in Parliament. Twenty-six more Palestinian prisoners were released to the West Bank and Gaza by Israel Monday night as part of the effort to get peace talks rolling. 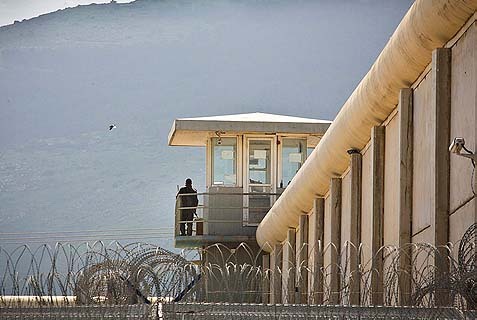 The release was the third of four tranches totaling 104 prisoners scheduled to take place over a period of months under the U.S.-brokered agreement. The BBC reported the freed inmates were greeted by cheering crowds when they arrived home. Eight of them were driven to checkpoints leading into Gaza and East Jerusalem, while the other 18 were taken to Ramallah in the West Bank, the British network said. The Palestinian prisoners had been convicted of crimes committed before the 1993 Oslo Accords, a set of agreements between the Israelis and Palestinians. The Almagor terror victims association had unsuccessfully appealed to the High Court of Justice against their release, arguing the government reneged on a decision not to release “terrorists,” Ynetnews.com reported. Most of the prisoners were convicted of murdering Israeli civilians and soldiers. Others were convicted of killing Palestinians they suspected were collaborating with Israel. “One of the things we knew when we captured these detainees is that they needed to stay in prison for the maximum period,” Meir Indor of the victims’ association told the Jerusalem Post. The Washington Post reported a few hundred people spent three days protesting in front of Netanyahu’s official residence. “The U.S. government would not release convicted murderers, so why is it pressuring Israel to release terrorists and murderers?” one of the protesters, Ben Ishai, said. At a meeting of his Likud Party Monday, Prime Minister Benjamin Netanyahu defended the decision to free the inmates, the BBC said. Israel completes third scheduled prisoner release • Bereaved families: Terrorists’ release is a “slap in the face” • Prisoners receive heroes’ welcome in Ramallah, Gaza • PM: Peace will be possible only if we can defend ourselves against any threat. Israel freed 26 Palestinian prisoners late Monday night in the third of four agreed-upon releases. Israel pledged to release a total of 104 prisoners as part of the deal last July to renew peace talks with the Palestinians. All of the security prisoners included in the third release were jailed prior to the 1993 Oslo Accords. They were all convicted of murdering Israelis and had served between 19 and 28 years in prison. Some 18 inmates released from Ofer Prison were bused to Ramallah through the Bitunia checkpoint; three prisoners were transported to the Gaza Strip via Erez crossing, and five others were released to their homes in east Jerusalem. The third stage of the prisoner release, like the two previous ones, met with fierce opposition from terror victims’ families. The Almagor Terror Victims Association filed a High Court of Justice petition seeking an injunction against the move, saying that including five terrorists who resided in east Jerusalem and carried Israeli IDs merely added insult to injury. “Releasing residents of Jerusalem by claiming that they are only ‘Israeli residents’ and not ‘Israeli citizens’ is a wisecrack move,” the petition said. The court denied the petition saying such matters were at the sole discretion of the government: “I see no legal grounds for the court to interfere in the [government’s] decision to go ahead with the third prisoners’ release,” Justice Zvi Zylbertal wrote in the ruling. Justice Elyakim Rubinstein, who opposed the release, noted in a minority opinion that the court could have issued in injunction concerning the five prisoners meant to be released to east Jerusalem, pending another government review of their case. Some 150 people, friends and relatives of terror victims, staged a protest rally on Monday night, marching from the Prime Minister’s Residence to the Old City and carrying black umbrellas and photos of some of the victims. The march was approved only after a short legal battle: The bereaved families sought to march from the Prime Minister’s Residence to the Muslim Quarter in Jerusalem’s Old City, where they wanted to stage a protest across from the home of one of the released terrorists. The Jerusalem Police denied the requests citing security concerns, which prompted representatives of the bereaved families to file a High Court petition. The families and the police were eventually able to reach a compromise by which the protesters were allowed to march up to the Western Wall plaza and from there only 15 people were allowed to approach the terrorist’s home, where they staged a short protest rally. “This day is a happy day for all of us, for our people, for our families, and for our hero prisoners who were freed today to live free. They were also free in the prisons,” Palestinian Authority President Mahmoud Abbas said Monday night, in a special reception held for the freed prisoners in Ramallah. Abbas greeted each of the prisoners released to the West Bank personally. “We will not sign a final peace deal with Israel before all the prisoners are released,” he said. The release coincided with Palestinian Authority celebrations marking the 49th anniversary of the founding of Fatah, and PA officials, as well as family members and thousands of supporters, jubilantly welcomed the return those they regard as national heroes. Smaller celebrations were also held in the Hamas-ruled Gaza Strip. Prime Minister Benjamin Netanyahu commented Tuesday on the prisoners’ release, saying: “The essence of the difference between us and out neighbors can be seen in one image. While we are willing to take very painful steps in an attempt to reach a peace deal that would end the conflict, they—along with their senior leadershipmdash;are celebrating. Amid a heavy downpour and a cacophony of shouts condemning Binyamin Netanyahu, the US and 26 terrorists due to be freed in another few hours, some 250 protesters marched Monday night from the Prime Minister’s Residence to the home of one of the terrorists. Cries of “Shame on you!” “Don’t release the murderers!” “Death to terrorists!” “Revenge!” and “Free Jonathan Pollard!” accompanied the slow procession of men, women and children as they made their way down Jerusalem’s Agron Street accompanied by dozens of police officers armed with assault rifles. Traffic came to a halt as the march paused at the US Consulate to decry US Secretary of State John Kerry. “Release terrorists in your own country!” shouted one man. “You have no right to put our people in danger!” exclaimed another. Although the vitriol was initially directed at Netanyahu’s gated residence, numerous protesters emphasized that their rage was primarily directed at Kerry and US President Barack Obama. “At the end of the day the release of these terrorists is a result of the pressure being imposed on Israel by Obama and Kerry,” said Jonathan Benedek as he stood under an umbrella beside his mother. “I don’t believe that any prime minister in his right mind would willingly release these terrorists or believe this is a good thing for Israel strategically. While Benedek conceded that the prime minister’s acquiescence to US pressure did not absolve Netanyahu from responsibility for the release, he asked that Israelis denounce the US government instead of attacking Israel’s leadership. “We should be venting our anger at Obama and Kerry, not Netanyahu,” he said. Benedek’s mother, Carol, a US citizen visiting her son from Maryland, derided the US government as well. The march, organized by Meir Indor, chairman of the Almagor terror victims association, started hours after the High Court of Justice rejected a petition from the organization not to let the terrorists go. “People convicted of murdering women, children and babies are being freed for nothing?” asked Tzvia Vodda rhetorically as the procession reached the Old City. “What? Is Jewish blood cheap? Have we not shed enough of it?” Vodda’s friend, Shoshanah Osterbach, said no peace deal was worth releasing convicted killers. “In America, have they ever done something like this? Who gives them the right to tell us what to do? We live here, not them!” Upon approaching the Old City home of Khalef Juma’a Mustafa Ahmad, police allowed only 15 of the demonstrators to come within 10 meters. “When we have the next Israeli victim, the High Court judges will not be able to say their hands did not shed this blood,” said Indor. “Shame on the Israeli government!” Rabbi Yehuda Ben-Yishai, the father of Ruth Fogel, who was brutally murdered in her settlement home along with her husband and three children in the 2011 attack that has come to be known as the “Itamar Massacre,” was among the 15 allowed near Ahmad’s residence. Indeed, Palestinian fireworks could be heard in the distance, while Ahmad’s home was strewn with colorful lights. “Look at these lights,” said one woman. “These are not Christmas lights – they’re lights to celebrate the release of a terrorist!” Appalled by the fireworks and lights, Lizi Hameiri, another protester permitted near the home, scolded Ahmad’s mother. “You are celebrating your son, but you have nothing to be proud of!” shouted Hameiri. “You raised a cold-blooded murderer! What did you nourish him with as a child? Hatred and death? Shame on you!” Despite the rage surrounding the protest, 12-year-old Zev Moore, who made aliya with his family from New Jersey last summer, said he was still proud to be an Israeli citizen and expressed both pride and hope. Israel began the process of releasing 26 Palestinian prisoners late Monday night, after the High Court rejected an appeal to stop the discharge. In Jerusalem, dozens of people, including family members of terror victims, protested the move, the third in a series of releases as part of ongoing peace negotiations. Three prisoners who were to be released to Gaza were loaded into vans to make their way to the Erez crossing, and five more began the short journey from Ofer prison in the West Bank to East Jerusalem, where they live. The full complement of prisoners were to be released after midnight. The five are the first East Jerusalemites to be released as part of the four-stage deal, which will see 104 prisoners go free. They will be released to an undisclosed location, and the rest will be transferred to the West Bank, where they are expected to be greeted with fanfare. The High Court rejected the petition by the Almagor Terror Victims Association to stop the release, as it has done twice before since August. Almagor had claimed that allowing the release of convicted terrorists into East Jerusalem would give the Palestinian Authority a claim over the city. Despite criticism from the right and left, Prime Minister Benjamin Netanyahu defended the release as a necessary, albeit tough, move for peace. Protests in Israel have intensified in the run-up to the planned release, with grieving families and others holding demonstrations in the capital against the move. On Monday night, dozens of people armed with black umbrellas marched from the Prime Minister’s Residence to the Old City of Jerusalem, where 15 of them demonstrated outside the home of Ahmed Halaf, one of the 26 prisoners slated to be released. The organizers had originally gone to court to be allowed to protest, but eventually came to a deal with police that only a limited amount of people would approach the home of Halaf. Earlier in the day, dozens of people protested at the entrance to Jerusalem, attempting to burn tires and block the main road into the city before being stopped by police. Two people were arrested just after midnight Sunday during a protest in front of the Prime Minister’s Residence in Jerusalem against the release of the 26 Palestinian prisoners. The protesters tried to run past the security guards at the entrance to Netanyahu’s home, banging on pots and yelling out slogans against the government’s decision to release the inmates. It was the mirror image in the West Bank, as the coming releases generated excitement throughout Palestinian society, where prisoners held by Israel are revered as heroes and freedom fighters. Families decorated their homes and neighborhoods with posters of their loved ones who were returning home and planned large feasts. The family of Ahmed Shihadeh was busy preparing a welcoming celebration in the Qalandiya refugee camp in the West Bank. Shihadeh, 51, has spent nearly 29 years in prison after being convicted in the murder of an alleged collaborator with Israel. His mother, Haseba, 75, said she has “spent my life” visiting her son, but hasn’t been able to make the trip for the past two years because she can no longer walk. “I’ve visited him in 14 jails. I would leave my kids screaming and go for a visit,” she said. In the East Jerusalem neighborhood of Jabal Mukaber, the sound of kettle drums and ululating women filled the air as residents braced for the return of Jamal Abu Jamal, who has spent nearly 20 years in prison for a stabbing attack. Women holding Abu Jamal’s picture sang and danced in circles and praised Palestinian President Mahmoud Abbas for securing his release. His mother, Rayouf, 77, who is unable to speak after suffering two strokes, sat in a chair with tears in her eyes. In an apparent attempt to blunt domestic criticism of such releases, Netanyahu is expected to approve plans to build 1,400 new homes in both the West Bank and East Jerusalem in the coming days. Amir Peretz, a Cabinet minister with the dovish Hatnua party, said the painful sight of watching convicted killers walk free could have been avoided had Netanyahu agreed to freeze settlement construction. “I would have preferred to freeze settlement building rather than releasing (Palestinian) prisoners, but at this point we must allow this stage to move forward, we must not do anything to prevent it,” he said. The “original sin,” he added, was agreeing to release any prisoners in the first place. “Israel should have rejected the notion that it has to pay a price for negotiations,” he said. On Sunday night, left-wing Meretz MK Nitzan Horowitz, a staunch supporter of peace talks with the Palestinians, said he surprised observers by coming out against the release during an interview with Channel 10′s Dan Margalit. “He asked me again and again if he had heard correctly, that I object to the release of terrorists now,” Horowitz wrote in a statement posted to his Facebook page. ”So I say it here again, in the clearest way possible: It is folly to release terrorists at such a stage of the negotiations, and certainly when [Prime Minister Benjamin] Netanyahu links the release to settlement construction. And what do we get at the end of the day? Wounds, bruises, a scourge. We are releasing murderers and also building in places where it is clear that we will not remain” under a permanent peace deal with the Palestinians. On Saturday night, a panel of Israeli Cabinet ministers approved the list of 26 Palestinian prisoners to be released on Monday. All of the prisoners on the list, save three, were convicted of murdering Israeli civilians or soldiers, or are Palestinians suspected of collaborating with Israel. In a press release Saturday night, the Prime Minister’s Office said all of the inmates had been convicted of offenses committed prior to the signing of the Oslo Accords in mid-1990s. Almost all of them were given life sentences, although a few would have been up for release in the next decade. They have all served between 19 and 28 years of their terms. Instead of being treated as common criminals, Palestinian terrorists receive an exceptional degree of autonomy within the prison walls. At the Bat Yam restaurant where Nidal Amar worked, they claimed not to have known that their employee, who ultimately abducted and murdered IDF soldier Tomer Hazan, was an illegal migrant. That defense, though, wasn’t enough to spare them some angry demonstrations. Yet those demonstrations should have targeted Yitzhak Aharonovich, the minister in charge of the Israel Prison Service, or else Prime Minister Netanyahu, who oversees the ISA. Why didn’t the IPS monitor that conversation? This week, while studying the website of the ISA, Almagor researcher Eliyahu Nissim unearthed a scandalous document: an official agreement between the state and imprisoned terrorist leaders, signed at the conclusion of a brief, system-wide hunger strike. To be clear: this is an official document on a government website in which terrorists—“security prisoners”—receive official recognition from the State of Israel. No longer are they murderers and criminals to be prevented from forming organized groups. Now they are a group of POWs from an enemy army, led by their commanders, to be treated in accordance with the Geneva Convention. Instead of being treated as common criminals (or worse), they receive autonomy within the prison walls and easements that those imprisoned on criminal charges do not enjoy. True, the agreement includes an absolute commitment by the prisoners to cease any and all terrorist activity occurring within Israeli jails. But that commitment didn’t help Tomer Hazan when he was strangled to death. The agreement goes on to stipulate clearly that it would be null and void were any terrorist attacks to be directed from jail. Yet despite the murder of Tomer Hazan, the easements stand: visitation, time spent in the company of other terrorists, social and cultural activities. Clearly the Netanyahu government, which specializes in freeing terrorists from jail, simply gave in to the imprisoned terrorists instead of breaking their hunger strike. Israel didn’t always fold and surrender when confronted by jailed terrorists. In August 2004, terrorists in Israeli jails, including famous ones such as Barghouti, initiated a comprehensive hunger strike. They understood from experience that they could defeat Israeli decision-makers by staging such a strike and manipulating public opinion and the media. Two times prior to that, in 1987 and 1992, hunger strikes had ended with improved conditions and far-reaching easements. What the terrorists did not understand is that there now were different officials in charge, first and foremost Yaakov Ganot, a man of action and himself a terror victim, who had begun to impose order. The new arrangements he had put in place didn’t suit the terrorists. They demanded, for instance, that their confiscated cell phones be returned to them. (The IPS and ISA, which knew precisely what they did with those phones, opposed the demand.) Ganot also began restricting the access of the lawyers who would come for daily visits with their imprisoned clients, with many serving as couriers to the terrorist organizations outside the prison walls. Against that backdrop, Dr. Aryeh Bachrach, a bereaved father and Almagor activist, was invited to attend a secret meeting with senior security officers. They asked him to pressure officials in the administration and the Knesset, and to mount a media campaign. By the next day, we had been granted a meeting with IPS Commissioner Ganot. We arrived at the meeting accompanied by a number of bereaved mothers, and presented our demand: not to give in to the terrorists. Ganot teared up and, with obvious emotion, summoned to the meeting all the senior officers on the floor. As a commander, he understood that they needed the bereaved parents’ support, a shot of motivation to hold fast against their adversaries. The IPS proceeded to go about its work with decisiveness and daring, coming up with new, creative ideas to solve problems. Hidden cameras caught Barghouti voraciously breaking his hunger strike in his cell. Other security prisoners, who had worked hard to convince their friends to do without food, also gave in to hunger and had what to eat. The strike came to an end. The terrorists gained nothing. Today, though, when the Palestinians shrewdly manipulate the media and the legal system in the best tradition of their terrorist organizations, Israeli officialdom prefers simply to surrender. Protesters can demonstrate outside the home of Ahmed Khalaf, who is set to be released Monday night as a “gesture” to the Palestinian Authority, the High Court said Monday. He is one of 26 terrorists to be released in the third round of terrorists releases Israel promised to undertake last summer, as the price for the return of the PA to the negotiating table. Activists planned the protest for Monday night, but the police refused to supply them with a permit. Khalaf is an Arab resident of Jerusalem who holds Israeli citizenship, who was arrested in 1992 for his role in attempting to carry out a terror attack with two other terrorists. His family lives in the Old City of Jerusalem. Protesters had planned to meet at the protest tent outside the Prime Minister’s Office in Jerusalem and from there march to the American Consulate, where they would then proceed to the home of Khalaf. Citing unnamed “security concerns,” police barred the protesters – and in response, activist groups, including the Yisrael Sheli organization and the Almagor terror victims’ group appealed to the High Court, demanding that the court order police to authorize the protest. Police told the Court that they did not wish to issue the permit because of concerns that fights and confrontations could break out between protesters and Arab residents. However, the Court decided, police fears of confrontation was not a sufficient reason to deny the group its right of protest. However, the Court limited the group that could protest directly outside the terrorist’s house to 15 members of families whose loved ones were killed in terror attacks organized by Khalaf. Khalaf, along with 25 other terrorists, is set to be released late Monday. Activists in the area of the Old City said that his family has already festively decorated their street to celebrate his release. Khalaf has been in prison since 1992 on charges of conspiring and carrying out a terror attack. Some 26 Palestinian prisoners were transferred to Ofer Prison in preparation for their release as part of the revived Israeli-Palestinian peace talks. Meanwhile, Almagor – a group representing terror victims – on Monday asked Israel’s Supreme Court to prevent the release of six of the prisoners, who are residents of eastern Jerusalem and hold Israeli identification cards. The prisoners, who will be released at 1 a.m. Tuesday, were being examined by the Red Cross and by doctors, and their identities were being checked. The list was published late on Saturday night on the Israel Prison Service website. Anyone who objects to the release of a prisoner must appeal to Israel’s Supreme Court within 48 hours. Some 23 of the prisoners were convicted of killing Israeli soldiers, civilians or Palestinians accused of collaborating with Israel. Demonstrations against the release including family members of terror victims, have been held outside the Prime Minister’s Jerusalem residence for the last several days, with a large-scale protest and vigil planned for Monday night. While the group’s request to hold the large-scale protest beginning on Sunday night through the release was at first denied, Jerusalem Mayor Nir Barkat told demonstrators he would see to it that they be allowed to hold the protest. Almagor petitions the Supreme Court with 2 requests: to stop the release of terrorists to Jerusalem, and to allow a banned protest. Almagor, the association representing bereaved families, filed two petitions Monday to the Supreme Court. One of them is against the decision to release 6 terrorists back to their Jerusalem homes; the other opposes a decision to ban a protest scheduled for Monday night at the Jerusalem home of one of the terrorists. “We came to file a petition to cry out those cries that are not heard,” stated Attorney Naftali Warzberger, who filed the petition in the name of Almagor. Elihai Ben Yishai, brother of Ruth Fogel, who was murdered along with her husband and three of their young children in a brutal Arab terrorist attack was present at the Supreme Court as the petition was being submitted. Israelis have been outraged at the releases, which many fear set a precedent for more terrorism. In an attempt to stem criticism, the Justice Ministry reiterated Monday that any terrorist who returns to terrorist activities, when caught, will have to not only serve the remainder of the past sentence, but also serve time for whatever act he was apprehended for, as a condition of the release. Outrage at the upcoming release of 26 convicted terrorists, set for Monday night and early Tuesday morning, has snowballed over the past several days. The Prime Minister’s residence in Jerusalem has been a popular protest site against the release, with bereaved families holding demonstrations there on Wednesday, Thursday, Saturday night, Sunday, and Sunday night. Protests have also erupted across Israel as the release looms. On Sunday night, activists from Judea and Samaria and the Kommemiyut organization staged a mass protest at the entrance to Jerusalem, warning government officials that “the writing is on the wall” for Israel’s future. On Thursday, another petition filed by Almagor preventing the entire release was rejected by the Supreme Court. “With all due understanding of the petitioners’ pain, their petition does not raise any legal ground for intervention. The claims have been raised and ruled on in the past,” stated the judges. Palestinian inmates slated to be released Monday night were transferred to Ofer Prison between Jerusalem and Ramallah on Sunday. They were undergoing identification procedures, medical checks and examinations by the Red Cross Monday. The release marks the third phase of a four-stage series of releases agreed on when peace talks with the Palestinians were resumed in July. The Almagor terror victims’ organization filed for an injunction Monday with the Supreme Court against the release of prisoners who are residents of east Jerusalem. The organization also demanded the right to protest outside the home of one of the prisoners slated for release. Two people were arrested overnight Sunday-Monday during a protest in front of the Prime Minister’s Residence in Jerusalem against the upcoming release of the 26 Palestinian prisoners. “He asked me again and again if he had heard correctly, that I object to the release of terrorists now,” Horowitz wrote in a statement posted to his Facebook page. ”So I say it here again, in the clearest way possible: It is folly to release terrorists at such a stage of the negotiations, and certainly when [Prime Minister Benjamin] Netanyahu links the release to settlement construction. And what we do get at the end of the day? Wounds, bruises, a scourge. We are releasing murderers and also building in places where it is clear that we will not remain” under a permanent peace deal with the Palestinians. “Bibi [Netanyahu] suffers from a split personality,” Horowitz added, “or he is simply a serial liar. With one hand he releases terrorist murderers, and with the other hand he allows extremists in his party, like Miri Regev, to pass laws that sabotage the talks.” Regev on Sunday pushed a bill through the Ministerial Committee for Legislation that would see the annexation of the Jordan Valley. All of the prisoners on the list (Hebrew PDF), save three, were convicted of murdering Israeli civilians, soldiers or Palestinians suspected of collaborating with Israel. In a press release Saturday night, the Prime Minister’s Office said all of the inmates had been convicted of offenses committed prior to the signing of the Oslo Accords in mid-1990s. Almost all of them were given life sentences, although a few would have been up for release in the next decade. They have all served between 19 and 28 years of their terms. Click here for a list of the convicts and their offenses. Almagor seeks injunction against government’s plan to free 26 more terror convicts until court can fully hear the petition. Almagor, the NGO that advocates for victims of terrorism, petitioned the High Court of Justice on Monday demanding that it stop the government from releasing Palestinians convicted for killing Israelis. The organization wants the court to issue an injunction against the move until it can fully hear the petition. As the Israeli government prepares to release 26 additional prisoners convicted of acts of terrorism before the signing of the Oslo Accords, the relatives of terrorism victims are also planning a large-scale demonstration in faint hopes of foiling the move. Almagor is arguing that the government has exceeded its authority by releasing Palestinians who are residents of east Jerusalem, and thus holders of Israeli identity cards. Some of the names of those due to be freed late Monday reside in east Jerusalem. Almagor is hoping that the High Court will at least delay the release and agree with its claim that freeing east Jerusalem residents would constitute an erosion of Israeli sovereignty in the capital. The organization is also demanding that the court permit a large-scale demonstration in front of the prime minister’s residence as well as a procession to the Old City. The Jerusalem district police is opposed to such a procession. Almagor is arguing before the court that the police is limiting its right to free expression and the right to protest. Palestinian officials condemned on Sunday the “Israeli blackmail” that led to the postponement of the release of 26 Palestinian security prisoners by one day. The prisoners were scheduled to be released on Monday night at 1 a.m., but technical issues forced the postponement to Tuesday at 1 a.m. The Shin Bet had already transferred the 26 prisoners expected to be released to Ofer Prison west of Ramallah, the Palestinian Authority said. According to the PA, the prisoners will be released at 1 a.m. Tuesday after being identified and being medically examined by the Red Cross. The Palestinian Prisoners Club said that the number of Palestinian prisoners still left in Israeli prisoners who were jailed prior to the Oslo Accord is 32, instead of the 26 that were supposed to remain in prison according to the deal agreed on in July. Among them are 14 Israeli-Arabs and one prisoner from Jerusalem who has an Israeli ID. Israel released a third group of Palestinian prisoners as part of a deal aimed at jumpstarting peace negotiations. Israel freed 26 prisoners late Monday night in the third of fourth scheduled releases of a total of 104 Palestinians jailed for killing Israeli citizens, according to news reports. The release came despite a Supreme Court petition from the organization Almagor, which represents victims of terrorism. The group asked the court to prevent the release of six of the prisoners who are residents of eastern Jerusalem and hold Israeli identification cards. The prisoners were greeted with a hero’s welcome in the West Bank and Gaza. Palestinian Authority President Mahmoud Abbas waited through the night to greet the men at his headquarters in Ramallah, the Associated Press reported. The list of prisoners was published late Saturday night on the Israel Prison Service website. Anyone who objects to the release of a prisoner must appeal to Israel’s Supreme Court within 48 hours. The prisoners to be released committed their terrorist acts before the Oslo Accords, and have served at least 19 years in an Israeli prison, according to a statement released Saturday night by the Prime Minister’s Office. “If any of those to be released resume hostile activity they will be returned to serve the remainder of their sentences,” the statement said. Twenty-three of the prisoners were convicted of killing Israeli soldiers, civilians or Palestinians accused of collaborating with Israel. Demonstrations against the release including family members of terrorist victims have been held outside the Prime Minister’s Jerusalem residence for the last several days, with a large-scale protest and vigil planned for Monday night. While the group’s request to hold the large-scale protest beginning on Sunday night through the release was at first denied, Jerusalem Mayor Nir Barkat told demonstrators he would see to it that they be allowed to hold the protest. Israel on Sunday announced the names of 26 long-serving Palestinian prisoners it will release this week under a U.S.-brokered formula to resume Mideast peace talks. All of the prisoners were convicted in connection to the killings of Israelis. The planned release, expected to take place late Monday, has angered many Israelis. Under heavy pressure from U.S. Secretary of State John Kerry, Israel and the Palestinians resumed peace talks in July. As a precondition, the Palestinians were forced to drop a demand for a halt in Israeli settlement construction in the West Bank and east Jerusalem, captured areas they claim for a future state. In exchange, Israel agreed to release 104 of the longest-serving Palestinian prisoners it holds. This week’s release will be the third of four planned phases. The Israeli government said the prisoners’ crimes were committed before the beginning of the initial Israeli-Palestinians peace talks in 1993. All have served sentences of between 19 and 28 years. In the southern Gaza Strip, the family of Rami Barbakh anxiously awaited his return. Barbakh has been imprisoned in Israel for nearly 20 years after being convicted of murdering an Israeli man in 1994. Dancing in their family home in Khan Younis, Rami’s parents handed out candies to well-wishers and prepared for a large family gathering upon his return. They put up posters of his picture and invited people to celebrate with them. 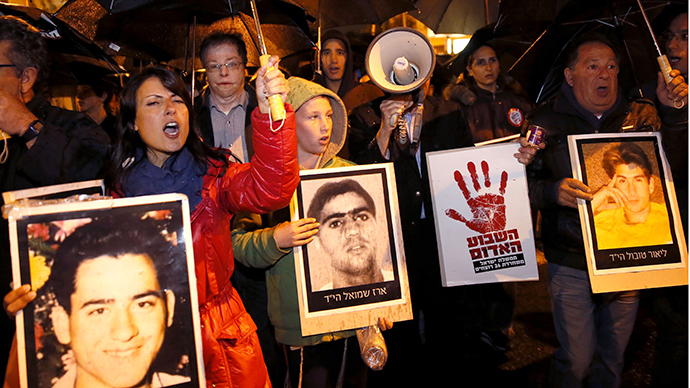 Meanwhile, Israeli relatives of the victims protested the release. Meir Indor, head of Almagor, an association of families who have lost loved ones in militant attacks, accused the government of selling out the victims. Kerry, who has been mediating the talks, is expected back in the region this week to calm rising tensions. In response to the planned release, Israel has said it formally will approve plans to build some 1,400 settlement homes in the West Bank and east Jerusalem. ‘No matter where these men go, they will kill – because that is the agenda of their lives,’ warns Meir Indor, head of Almagor Terror Victims Association. Indor, the chairman of the Almagor (“Don’t Be Terrorized”) Terror Victims Association, who was born and raised in Israel, said that after serving in the IDF and hunting terrorists, he knows unequivocally that releasing them is a profound and deadly mistake. Joined by several demonstrators stationed a few hundred meters from the Prime Minister’s Residence in Jerusalem for the fifth day in a row, Indor added that the hypocrisy exhibited by the United States is as egregious as it is deadly. This sentiment, accompanied by palpable rage, was reiterated Sunday by a cross section of Israelis, all of whom vehemently oppose the scheduled release of 26 convicted Palestinian killers late Monday night or early Tuesday morning. A celebratory ceremony will immediately be held in Ramallah with Palestinian Authority President Mahmoud Abbas. In July the government agreed to free 104 such Palestinians in four stages during the nine-month negotiating period that ends in April. This is the third release. Fifty- two prisoners have been freed in two prior releases. Hameiri deemed the hypocrisy of the US demand as unacceptable and unconscionable. “You are forcing us to release predator animals in our streets – something you would never do in the US,” she said, raising her voice. “You sell my people’s blood cheap and our kids are not safe anymore because of you!” Ortal Tamam, whose uncle was murdered by terrorists in 1984, said Kerry has ostensibly treated Israelis like “puppets” in an internationally staged performance. Further exacerbating the protesters’ anger was Kerry’s widely ridiculed statement in November warning Israelis that if peace talks break down, it may usher in a third intifada. “When Kerry said that, he ensured the Arabs will make it true,” said Indor. In an open letter from Netanyahu to Israeli citizens in July, shortly before the initial phase of the fourstage release, the prime minister addressed his controversial decision, noting that he understood the pain it would inflict on the families of those who had been killed. Asked how she is internalizing the prisoner release, Sara Hatzni-Cohen, who is eight months pregnant, said it has forced her to ponder how she will explain such a morally tenuous arrangement to her son one day. “How can I explain to my son when he is older what Israel did?” she asked. “How can you send your son to the army when you know he puts his life at risk to fight terrorists, and 10 years later the government that sent him to fight releases them?” Despite her misgivings, Hatzni-Cohen said she will not hesitate to send her son to the IDF when the time comes, although it will be exceedingly difficult. Meanwhile, American-Israeli David Jacobs cited the US response to the September 11, 2001 attack on the World Trade Center to illustrate American hypocrisy. Jacobs then asked rhetorically: “Now Israel is releasing terrorists at the request of the US government?” Ron Hillel, an 18-year-old conscript preparing to join the IDF in the coming months, attended the demonstration with his friends Yuval Arzoni and Idan Amer, also new recruits. Hillel said Tuesday’s release is antithetical to why he is joining the army. Asked how the decision has affected his view of the leadership of the country, Hillel paused for a moment before looking at the images of the murdered terror victims. “It makes me want to one day become the man in power, to make sure this never happens again,” he said. 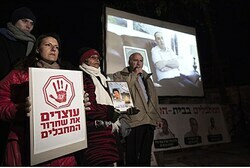 A group representing Israeli victims of terrorism filed a petition to block the release of Palestinian prisoners. Twenty-six prisoners expected to be set free early Tuesday as part of the revived Israeli-Palestinian peace talks were transferred to Ofer Prison in preparation for their release. On Monday, the organization Almagor, which represents victims of terrorism, petitioned Israel’s Supreme Court to prevent the release of six of the prisoners, who are residents of eastern Jerusalem and hold Israeli identification cards. It is the third round of Palestinian prisoner releases since the American-backed peace negotiations began in July. The list was published late on Saturday night on the Israel Prison Service website. Anyone who objects to the release of a prisoner must appeal to Israel’s Supreme Court within 48 hours. Some 26 Palestinian prisoners set to be freed on Monday night in third stage of prisoner release • Demonstration against the release held outside the Prime Minister’s Residence in Jerusalem • Bereaved daughter: The release floods us with pain and loss. With the third stage of the Palestinian prisoner release set to be carried out on Monday night, demonstrations against it continued on Sunday. Police dispersed a protest outside the Prime Minister’s Residence in Jerusalem, and two demonstrators who entered a security zone were arrested. Ortal Tamam, niece of murdered soldier Moshe Tamam, received an order from the Jerusalem municipality on Sunday morning to dismantle within three hours the protest tent she had erected outside the Prime Minister’s Residence. The order drew criticism, and shortly before the deadline, Jerusalem Mayor Nir Barkat came to speak with Tamam, promising to help find a solution that would allow her to stay in place. “The entire nation of Israel identifies with your cries,” Barkat said. 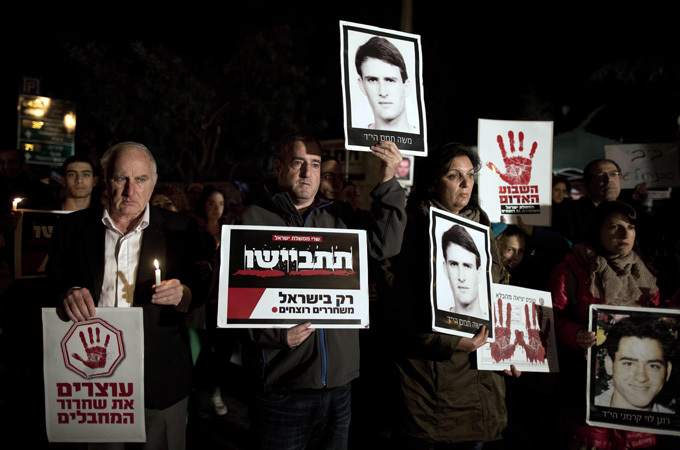 In another protest, dozens of right-wing activists gathered at the main entrance to Jerusalem and called on the government not to free murderers. Two demonstrators were arrested at this protest. The Almagor Terror Victims Association and bereaved families were set to present a petition to the High Court of Justice on Monday against the prisoner release. The third stage of the prisoner release will include the killers of Israel Prize recipient Professor Menahem Stern. “It’s a very difficult feeling,” said Stern’s daughter, Meira Stern-Glick. “This time, I believe there were options other than freeing the murderers. They should be in jail for the rest of their lives. The bereaved families understand more than the rest of the public the pain and injustice involved in this. Meanwhile, as Israelis deal with the pain of the upcoming release, the Palestinians are preparing welcome festivities for the freed prisoners. Some 26 prisoners will be transferred from the Ofer prison to the Huwwara checkpoint near Nablus. From there, they will head to the Muktataa compound in Ramallah, where there will be a celebration attended by Palestinian Authority President Mahmoud Abbas. U.S. Secretary of State John Kerry is expected to arrive in the region this week for the ongoing peace talks. The Israeli government Monday night released another 26 Palestinian prisoners serving long sentences for killing Israeli citizens, part of a deal struck between Israeli Prime Minister Benjamin Netanyahu and U.S. Secretary of State John F. Kerry to bring Palestinian leaders back to peace negotiations. A group of terror victims’ families and their supporters, camping out outside the Prime Minister’s Residence in Jerusalem ahead of Monday’s scheduled release of 26 long-serving Palestinian prisoners, were asked early Sunday by city authorities to clear their camp, but the order was later rescinded by Jerusalem Mayor Nir Barkat. The municipality had said that it “could not allow the public space to become residential” and ordered the families to clear out within a few hours, but noted that they would still be permitted to protest during daylight hours. However, later in the day, Barkat visit the protesters, expressed his solidarity with their cause and said that he would arrange the “technical issues” needed for the demonstration to continue. Although the families erected a tent on a sidewalk outside the prime minister’s official residence in the Rehavia neighborhood of the capital, a representative said that no one was sleeping overnight at the location. “The prime minister and [other cabinet] ministers aren’t able to deal with the families’ outcry and want to shut us up,” a spokesperson for the group, the Almagor Terror Victims Association, told Ynet news earlier. On Sunday, a full list was released of the 26 prisoners, all serving lengthy or life sentences for terrorist acts committed before the 1993 signing of the Oslo peace accord, including the murder of Israelis or Palestinians suspected of collaborating with Israeli security services. The release, slated for Monday night, is the third of four scheduled releases of long-term Palestinian prisoners serving in Israeli jails under the framework of the ongoing, US-sponsored Israeli-Palestinian peace talks. Five out of the 26 Palestinian prisoners to be released are East Jerusalem residents with blue ID cards, entitling them to Israeli citizenship, health insurance and other benefits, it was reported on Sunday. Almagor, which publicized the information, said it was planning to appeal the release to the High Court, alleging that because the Palestinian prisoners are residents of Israeli territory and could receive benefits from the state after their release, granting them freedom goes against the terms of the release agreement, Army Radio reported Sunday morning. Arab residents of East Jerusalem, which Israel captured from Jordan in 1967 and formally annexed in 1980, carry the blue ID cards of Israeli citizens but most, by choice, are not Israeli citizens and do not carry Israeli passports. Although they are entitled under Israeli law to take Israeli citizenship, very few choose to do so. Unlike Palestinians in the West Bank, East Jerusalem residents can move freely throughout Israel. A list of those said to be East Jerusalem residents provided to The Times of Israel by Almagor contains the names: Abu Hadir Muhammad Yassin Yassin, who shot and killed an Israeli in Jerusalem’s Old City; Ahmad Yusuf Bilal Abu-Hassin, who murdered multiple Palestinian collaborators with Israel; Mustafa Ahmed Khaled Jumaa, who was convicted of aggravated assault and was to have been released in 2016; Da’agna Nufal Mahmad Mahmoud, who helped murder an Israeli in Holon and who, according to Almagor, is a resident of the Shuafat refugee camp; and Ahmed Ibrahim Jamal Abu-Jamal, who was convicted of attempted murder and was to have been released in 2016. Demonstration comes as Israel reveals names of 26 prisoners to be freed as part of ongoing peace negotiations. 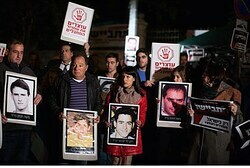 Dozens of Israelis gathered outside Prime Minister Benjamin Netanyahu’s home to protest against the planned release of Palestinian prisoners. The demonstration on Saturday came as Israel released a list of 26 Palestinian prisoners to be freed next week amid US-sponsored peace talks. Netanyahu’s office said the release of the prisoners was authorised on Saturday evening, and all of those named had served sentences of 19 to 28 years. The release was to be carried out at least 48 hours after the list was published, in order to give the Israeli High Court time to look into appeals. But since the government already approved the release, the High Court was expected to reject any petitions. This marks the third group of a total of 104 prisoners Israel agreed to release, with the first two batches freed in August and October. The US is seeking to broker an agreement on a “two-state solution,” in which Israel would exist peacefully alongside a new Palestinian state. The prisoners’ release is viewed by the US as a vital confidence-building measure. The terror victims association Almagor claims that on the list of terrorists to be released tomorrow are terrorists who are also Israeli citizens, according to a report in Arutz-7. The organization says this goes against the promise made to them, that at least Arab terrorists who are also Israeli citizens would be released to the Palestinian Authority during this prisoner release. Almagor is preparing a petition to the Supreme Court to block the release of those Arab terrorists they claim are also Israeli citizens. Bereaved families continue protest against terrorist release in front of Prime Minister’s house Saturday. Dozens of bereaved families gathered in front of Prime Minister Binyamin Netanyahu’s Jerusalem home Saturday night, in another wave of protests against next week’s upcoming release of 26 terrorists to the Palestinian Authority (PA). The demonstration is yet another outcry against the upcoming release, which is slated for Monday night and early Tuesday morning. This week’s release is the third installment in a series of “gestures” to the PA, with a total of 104 convicted terrorists and murders slated for release by March 2014. On Wednesday, another mass protest erupted at the Prime Minister’s residence, with relatives of terror victims standing in the cold to show public disdain for the slated releases. The protest came just hours after bereaved mothers met with Knesset members from all factions and called for a halt to the release. “I call on the Prime Minister to reconsider the release of terrorists given the recent terror attacks,” declared Deputy Defense Minister Danny Danon at the meeting. “In a normal country in which a bus blows up on Sunday, a police officer is stabbed on Monday, and a worker fixing the security fence is shot to death on Tuesday, terrorists would not be freed the following week as a ‘gesture,'” Danon argued. Thursday saw more protests, this time outside of a government compound in Tel Aviv. The protest was attended by dozens of families and members of Almagor, the terror victims’ advocacy organization who has opposed the releases throughout the entire negotiations process. “We should say to John Kerry and to (US President Barack) Obama, don’t press Israel. No to double standards, Israelis and Americans have the same rights,” stated Almagor Chairman Meir Indor at the protest. He added that just as the US doesn’t release terrorist murderers, it shouldn’t press Israel to do so. A “Melaveh Malkah” post-Shabbat meal will be held on Saturday night at 7:30 p.m. with three bereaved families who are protesting the upcoming terrorist release in a tent outside the Prime Minister’s Home in Jerusalem. The Almagor terror victim’s organization has invited the public to take part in the meal in order to show solidarity with the families. “We should say to John Kerry and to [US President Barack] Obama, don’t press Israel. No to double standards, Israelis and Americans have the same rights,” argued Indor. He added that just as the US doesn’t release terrorist murderers, it shouldn’t press Israel to do so. “On this day we say to governmental ministers that supported the terrorist release, shame on you. Look us in the eyes and tell us why you conducted the release of terrorists up till now … so they will arrive in [PA Chairman] Mahmoud Abbas’s open arms? We release and they slaughter us,” said protesters. Some of the protesters blocked the road saying “Jewish blood is not a gesture.” They succeeded in slowing down traffic for several long minutes until police officers were able to clear them. Netanyahu is poised to announce new housing plans next week timed for the terrorist release. Bereaved father and current events analyst Dr. Aryeh Bachrach recently called Netanyahu a “scoundrel,” arguing that the Netanyahu uses housing plans to deceive the voting public. Almagor Terror Victims Association says 7 of 16 victims’ families were not warned which prisoners had been slated for release. Some 2,000 people protested on Monday evening outside Ofer prison against the upcoming release of 26 Palestinian security prisoners, Israel Radio reported. MKs from Bayit Yehudi, a party who has vehemently objected to the release of prisoners as part of the ongoing peace talks, attended the protest. Earlier on Monday, Almagor Terror Victims Association chairman Meir Indor told the Knesset Interior Committee that several terror victims’ families had not been informed about which prisoners had been slated for release before their names reached the press. “The equation ‘freeing prisoners equals talks’ or ‘freezing settlement construction equals talks’ is wrong, and the government has to stop this,” Knesset Interior Committee chairwoman Miri Regev (Likud Beytenu) said. Regev called the committee meeting to discuss how the soon-to-be-released prisoners were chosen. An Interior Ministry representative at the meeting said he did not know how the terrorists were selected or who made the list. Indor complained that only seven of the 16 families of victims of the terrorists being released had been notified before the list of prisoners was sent to the press. “This is an injustice on top of the even bigger injustice of releasing prisoners,” he said. Justice Ministry attorney Yifat Raveh said that the ministry began contacting families two hours before the list became official, but did not successfully reach everyone. Regev told the Justice Ministry representative that the process of notifying families should have begun earlier, not the same night the names were being released to the press, since a tentative list had been made a week earlier. MK David Tsur (Hatnua) continued his party’s line of blaming the Bayit Yehudi Party for prisoner releases, saying that the government had a choice of gestures it could have made at the beginning of talks – negotiating on the basis of 1949 armistice lines, freezing settlement construction or freeing terrorists – and that the worst was chosen because of pressure from the right-wing party. “Bayit Yehudi ministers are responsible for the prisoner release because they prevented any other option in order to avoid a political backlash,” MK Tamar Zandberg (Meretz) said. Indor asked Tsur if he thought that Palestinian prisoners would have been released once an agreement was reached, even if one of the other options had been chosen, and Tsur said, yes. “In any other place in the world, if someone murdered a Jew and the government wanted to release him, we would shout that it’s an injustice,” MK Shuli Moalem-Refaeli (Bayit Yehudi) added. Regev said that “no normal country in the world frees murderers,” and Zandberg accused her and other “second-tier Likud MKs” of letting out their frustrations at the government even though it is led by their party. “With all due understanding for the petitioners’ pain,” there is no legal pretext for the court’s intervention, says judge. The High Court of Justice on Thursday rejected a petition against next week’s scheduled release of a third batch of Palestinian prisoners, 26 in number. Naor was referring to petitions by Almagor, the Terror Victims Association, against the first and second prisoner releases, in August and October, respectively. Under the agreement that restarted Israeli-Palestinian talks in July, Israel promised to release four batches of prisoners altogether over the course of the nine months of talks. In those cases, and again in this one, the court found that such a decision is within the government’s authority, and that no egregious flaws were found in the decision-making process that could justify court intervention. The current petition was filed by five members of the Schijveschuurder family, who lost five other members of their family in the 2001 bombing of the Sbarro restaurant in Jerusalem. One of the terrorists responsible for that attack, Ahlam Tamimi, was freed in the 2011 exchange for kidnapped soldier Gilad Shalit, while two others remain in jail. According to the petition, ever since her release, Tamimi has been inciting other Palestinians to murder Israelis. The petition asked the court to order the government both to reconsider its decision to free the current batch of prisoners, whose identities haven’t yet been announced, and to set clear criteria for any future release of terrorists. The state said in its response that a date for the third release hasn’t yet been set, but it is expected to happen in the coming days. Haaretz reported on Wednesday that Prime Minister Benjamin Netanyahu is expected to announce Israel’s plans for new housing tenders in settlements in the West Bank and East Jerusalem next week, following the release of the third group of Palestinian prisoners. According to an official in Jerusalem, Netanyahu did not heed the United States’ request to postpone the announcement of the new tenders, and rejected warnings by the European Union on the matter. The names of the terrorists will be released 48 hours before they are actually released, in order to allow families and groups opposed to the release to petition against it. Working with the Almagor organization, several families whose loved ones were murdered by the terrorists likely to be released said they would set up protest tents outside the government’s Jerusalem headquarters when the vote to release the terrorists is taken by the cabinet next week. “I call on the Prime Minister to reconsider the release of terrorists given the recent terror attacks,” Danon said. “In a normal country in which a bus blows up on Sunday, a police officer is stabbed on Monday, and a worker fixing the security fence is shot to death on Tuesday, terrorists would not be freed the following week as a ‘gesture,’” he said. 3rd batch of releases set for early next week, even as terror attacks spike since last Friday. Protests planned opposite Netanyahu’s house. Despite the recent wave of terror attacks since last Friday, the Israeli government intends to go ahead with a third batch of terrorist releases early next week, as part of “gestures” to the peace talks with the Palestinian Authority (PA). Reports indicate the government will similarly start a new Judea and Samaria building freeze next week as well. The looming release of 26 terrorists, on either Sunday or Monday, is the third of four installments in which 104 terrorists were promised to go free during the 9 month peace talks. The Almagor terror victims announced that it will hold a protest vigil opposite Prime Minister Binyamin Netanyahu’s home starting Wednesday morning. At the protest a large screen is planned to be set up, where video recordings of bereaved family members asking Netanyahu to cancel the release will be played. Opponents of the terrorist release note that according to agreements between Israel and the US, each release batch is to be preceded by a special meeting of a ministerial cabinet to determine whether or not to approve the release. Those against the release argue that if meeting is a rubber stamp process which can only approve the release, there is no point in dividing the release into batches. Rather they reason that the release should be all at once to prevent the anguish of bereaved families. Opposition to the release has been expressed from within the coalition government itself. Jewish Home Chairman Naftali Bennett commented sardonically that “we continue the diplomatic process as if there is no terror, while the Palestinians are continuing the terrorism as if there is no diplomatic process.” Deputy Defense Minister Danny Danon (Likud) has similarly opposed the releases. The terrorist releases come as part of ongoing peace talks, whose secretive contents were recently revealed by PA sources. US Secretary of State John Kerry’s proposed plan, which he intends to push through in January, includes international control of Jerusalem, mass Israeli withdrawals in stages, and guarantees from Israel to “earn” its status as a Jewish state. Meanwhile PA Chairman Mahmoud Abbas has rejected the plan. A senior Palestinian Liberation Organization (PLO) official revealed the PA is staying in the talks only to free all 104 terrorists. After initial reports that Kerry might delay the third batch of terrorist releases to pressure Abbas into accepting his plan, Abbas rejected the notion, threatening “total failure” in the talks. The Almagor terror victims association announced Tuesday night that, starting on Wednesday afternoon, it will be holding a protest vigil outside the home of Prime Minister Binyamin Netanyahu in Jerusalem, over Israel’s intention to release terrorists despite recent terrorist attacks. The activists are planning to screen movies on a large screen showing bereaved family members asking Netanyahu to cancel the planned release. If you take a look at Kerry’s plan, you’ll see plenty of military concepts and jargon taken from cyberspace and high tech, but very little security. Obama and Kerry want to convince the Israeli public that the agreement they’re promoting is a really great one. To keep people from worrying about the terrorism that will come in its wake (remember what followed the Oslo Accords and the Disengagement), they’ve added an American security envelope to the package. The plan is supposed to be one that was prepared by about a hundred workers who tag along with General John Allen, one of the U.S. Army’s “good old boys”—i.e. an officer whose promotion was put on ice due to suspicion of sexual harassment—who left Afghanistan to contend with the many problems and the confusion in the military that resulted when Obama forced a retreat from there. Now General Allen will seek to prove himself in the Israeli–Palestinian arena. If you take a look at the plan, you’ll see plenty of military concepts and jargon taken from cyberspace and high tech, but very little security. The harsh reality is that this plan was in fact authored by organizations of the Israeli left, and only then packaged in American wrapping paper. Contributors include IDF officers who have long been pushing for a retreat from Judea and Samaria and for the establishment of a Palestinian state. People like Brig.-Gen. (res.) Gadi Zohar, head of the Council for Peace and Security, who earned his reputation as an enemy of the settlement enterprise when he headed the Civil Administration. As far as he’s concerned, there is no need for a military presence in the Jordan Valley, let alone Jewish communities. A Multinational Force (MF) shall be established to provide security guarantees to the Parties, act as a deterrent, and oversee the implementation of the relevant provisions of this Agreement …. Israel shall complete its withdrawal from the territory of the state of Palestine within 30 months of the entry into force of this Agreement, and in accordance with this Agreement. Israel will maintain a small military presence in the Jordan Valley under the authority of the MF and subject to the MF SOFA [status of forces agreement] … for an additional 36 months …. Israel may maintain two EWS [early warning systems] in the northern and central West Bank …. The EWS shall be staffed by the minimal required number of Israeli personnel and shall occupy the minimal amount of land necessary for their operation …. Access to the EWS will be guaranteed and escorted by the MF. There is little difference between this and the proposal sponsored by General Allen: an agglomeration of security solutions that are dependent in part on gadgets and mostly on a multinational force and cooperation with Jordan. Prior to this week, there were rumors circulating that the IDF didn’t oppose the plan, and even that the IDF Planning Directorate was working with General Allen and his staff. The media made clear that Netanyahu would have a hard time saying no to General Allen since the relevant parts of the IDF already agreed to a plan with similarly far-reaching concessions back in the Olmert era. This week, though, we received confirmation that the IDF is collaborating with the American general. The leaders of the Yesha Council met with Nitzan Allon, the general heading Central Command, in the middle of the week, and a recording of what he had to say was subsequently leaked. Allon then explicitly acknowledged that the IDF is meeting with General Allen. First, the IDF is working with the Americans on a comprehensive retreat plan. They already started talking about it in Olmert’s time. The IDF insists on Israeli control of the Jordan Valley, extending to the Allon Road and beyond, while the Americans want the IDF to control a smaller space. What about the mountains? Silence on this point, despite discussion of arrangements for the Jordan Valley, makes clear that the IDF is not insisting on control of the mountains. MK Moti Yogev (Jewish Home), a colonel in the reserves, takes exception to the IDF’s position. Rabbi Moshe Hager, who served as a senior commander in Operation Defensive Shield and has a rich background in counterterrorism, says it won’t be possible to defend the Judean foothills without a presence in those areas. The settler elder, who came to Israel from Germany after Kristallnacht, fought and was wounded in the War of Liberation, was a leading Mapai youth volunteer, and today lives in Hevron, looks around at those who would trade away our land, and understands that at the end of the day, the international pressure brought to bear on us is a blue-and-white product manufactured by Israeli Jews. 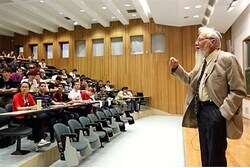 Professor Aumann is a Nobel Laureate in Economics and a noted academic scholar, yet Haifa University chose to reject him—not based on his scholarship, but ostensibly for his political views. Shaked fired back at the claims Monday, pointing out both that Aumann’s political views should not be a factor in his academic standing and that other factors in his favor were not taken into account during the review. Shaked’s imperative echoes similar statements by MK Shimon Ohayon (Likud–Beytenu) Sunday, who vowed to bring the issue to the Knesset plenum. Earlier this year, terror victims’ advocacy organization Almagor publicly spoke out against the university for providing legal aid to convicted terrorists.